Every once in a while the Uranian System still manages to surprise me with its pinpoint precision of details, in spite of the fact that I have gotten used to it over the years and even come to expect it. But before I go on to tell about one such case, I would like to briefly address some philosophical and methodological principles related to that. 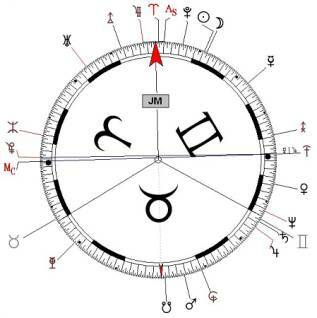 Over the years I began to notice that, in most cases, the information that is revealed by the Trans-Neptunian hypothetical Planets (TNP’s) and the 90° Dial techniques actually reinforces the traditional chart analysis when the combinations of House-Sign-Planet-Aspects are interpreted correctly using the classical rules. Such reinforcement usually comes as repetition of a theme, while making it more specific. Traditionalists might use this as an argument against the need for the Uranian system, but I find that this fact is amazing in itself, since such additional information comes from a set of tools that appear to be different and unrelated to the classical methods. In such instances, these additional indications, as quoted literally from Witte’s book “Rules For Planetary Pictures”, make the chart analysis more fact-specific and more to the point. In other cases, the Uranian methods helps narrow down a possible range of manifestations that are broadly indicated by the traditional ones. A third situation is when the Uranian method brings out facts that you wouldn’t even suspect because they are hiding in the deep recesses of the classical astrological significations. At times, the phrases from Witte’s book will seem odd or unconnected with the person’s story, as seen from the traditional chart’s view. It such cases, it is usually a matter of modifying the language a little bit, or finding a modern equivalent for that fact, or just digging deeper into our storehouse of traditional knowledge. All this has led me to establish a principle which I call “Cross Reference” - moving from the Uranian view to the Traditional view and vice versa. This approach has served me very well over the years and simplified things significantly. Such cross-references remove doubts and add credibility and confidence in the analysis process for both astrologer and client. Here is how all the above came together in a reading for a client. Please note that the following is not a complete chart delineation, but sampling only. 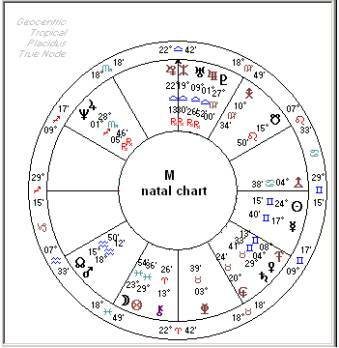 First, let's take a look at her traditional chart and consider the fact that in addition to her Gemini-Sun, her last name is actually Mercurio, which is amazing by itself. The Mercurial-Gemini connection does not end here. The client has a degree in education and at the time was teaching kindergarten. Working with the 90º Dial, while preparing my notes prior to the reading I took notice of Witte’s phrase for the configuration of Mercury/Jupiter=Kronos (see dial view-1), which reads “An artist with words”. I thought it had to be very meaningful career-wise because Kronos is also exactly configured with the MC, with Cupido and with the Lunar Nodes, all of which are tightly connected with the Aries Point, and as a result, had to do with some professional activity. I wasn’t sure how to phrase it in a way that would fit the context of the main discussion that I was planning to have with her, and in a flash of intuition I added the words “stand-up comedian” to my notes. As the reading proceeded, I decided to check it out so I asked her if there was anyone in her life who was a standup comedian. Well, it turned out that she herself used to do it for about eight years in her early twenties, writing her own material and trying to make it in the club scene in New York City. Also, her boyfriend writes joke material for well-known comedy TV shows. Well, you could have knocked me over with a feather when she told me this. It doesn’t get more specific than that! Cross-reference with the traditional chart shows all these symbolisms in Venus ruler-MC & 5H, in Gemini, disposed by Mercury, ruler-7H & 6H, in Gemini, conjunct Sun in Gemini, with an applying square from the Moon in 3H, who also trines Jupiter ruler-ASC. You might say that Gemini people are communicative and like to tell jokes, yet, the dial pictures and Witte’s phrase are so much more direct! Personally, I know a number of Sun-Gemini persons who never tell a single joke. Neptune/Kronos=Venus: For this configuration, what caught my eye in Witte’s book was the word “abbess” (female superior of in a convent). More depth is added by Venus=Poseidon=Sun=Moon-mp-Nodes, all suggesting female spiritual connections. Obviously, Venus is also opposite Neptune in the ‘normal’ view. From Hellenistic astrology we know that the 3H is called Goddess and the 9H is called God, and my client has the Moon in Pisces in the 3H, opposite Pluto in 9H, both square the Sun – all of which spells ‘a mental and spiritual influence of a mature woman’. So I asked her whether there was a woman in her life who was an abbess, or holding a high rank in the church, possibly an older sister. It turned out that it was a very loving old aunt - a saintly person and a devout Catholic going to church everyday, who used to be a nun and later on became a school principle. Spiritual guidance also came from a very special female friend - a Jungian psychologist and a yoga and dance therapy teacher, who provides very loving and grounding influence. My client herself is also very interested in learning more about faith in general and constantly reads and compares the various religions of the world. Uranian ‘findings’ make you stop and think again about the traditional chart and help you avoid preconceived notion about the client that may influence your evaluation. For a number of reasons, not listed here, it occurred to me that he might be gay, and this was confirmed by him at the reading. 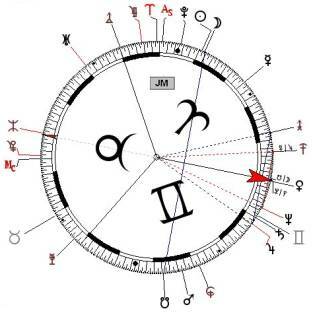 The chart had Sun=Cupido, which means “The married man”. I wanted to check this out and presented it to him as a question. Well yes, he had been married to a woman, (and still was at the time of the reading) for the purpose of obtaining legal immigration status. Also, in his current male relationship he was behaving as in a marriage. The strong presence of Cupido was a signal for me to pay attention to it even when the rest of the reading, up until that moment, did not point in this direction. In a more recent meeting with him I found out that he was still legally married, and also that he was planning to move in with another person, in an unrelated situation. Midpoints have become part of Mainstream Astrology and are used by non-Uranian practitioners as well. Theoretically, midpoints can number in the hundreds, especially when you add the eight TNP’s, thus cluttering the chart as well as the thinking process of the astrologer. The following guidelines can help in reducing this enormous number and make it workable. Incidentally, the same approach can be used with Asteroids. “No Pain No Gain”: Using all these techniques means more work for the astrologer, but the added value they bring is truly worth it. This cannot be overstated in an age when astrologers have gotten used to pushing the computer button and get all the charts and the canned reports on their printer. Do Not Clutter the Regular Chart: It is advised to print the chart without the “extras” and copy or print them on the side. Get Organized - Use Color Code to match your mental association, so it doesn’t look like one big mess, allowing your mind to prioritize and focus on one thing at a time. Pick & Choose: You Don’t Have to Interpret Everything! 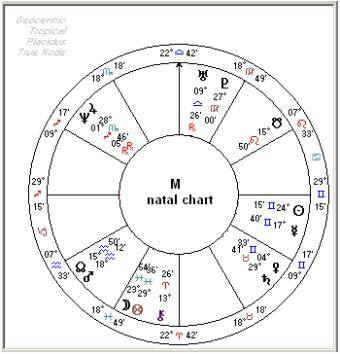 In the traditional chart we interpret all the planets, even when unaspected. For the Uranian configurations - use only those that make an aspect with, or contain at least one “real” planet, preferably up to Saturn, and-or other Personal Points. Aspects are contacts - “Good” or “Bad” is determined by the planets’ essential signification. Use Hard Aspects Only: That is where the action is. Orbs: The smaller the better. For midpoint=planet I will use a maximum of 0º 25’. © Meira B. Epstein, All Rights Reserved.